Sir Bradley Wiggins is counting down the days he has left with Team Sky, whether he likes it or not. His last race in the black and blue colours, after five years with the British team, comes in the ‘Hell of the North’ or Paris-Roubaix on April 12. The Sky/Wiggins era that began in 2010 with a bold bid to win the Tour de France now ends with an equally bold bid to win the Queen of the classics. This week the 34-year-old Brit is racing the Belgian stage race, the Three Days of De Panne as part of his build-up. He already helped Ian Stannard win Omloop Het Nieuwsblad and raced the first 100 kilometres of a wind-swept Ghent-Wevelgem last Sunday. “I think you automatically do, and you try not to,” Wiggins said of ticking off his remaining days with Sky. The Three Days of De Panne ends on Thursday with a split stage, a road race in the morning and a time trial in the afternoon. Riders often skip the last day in the lead-up to Flanders, but Wiggins could aim for the time trial and overall win. On Sunday, he will help Geraint Thomas in his attempt to win the Tour of Flanders. He will use the rest of his time to focus on Paris-Roubaix, racing the Scheldeprijs mid-week on Wednesday and previewing the famous cobbled roads in northern France. His bid to win the monument will be his last race in Sky colours before stepping down to head his continental team Team Wiggins and focuse on the Hour Record in early June and then the team pursuit at the 2016 Olympics. 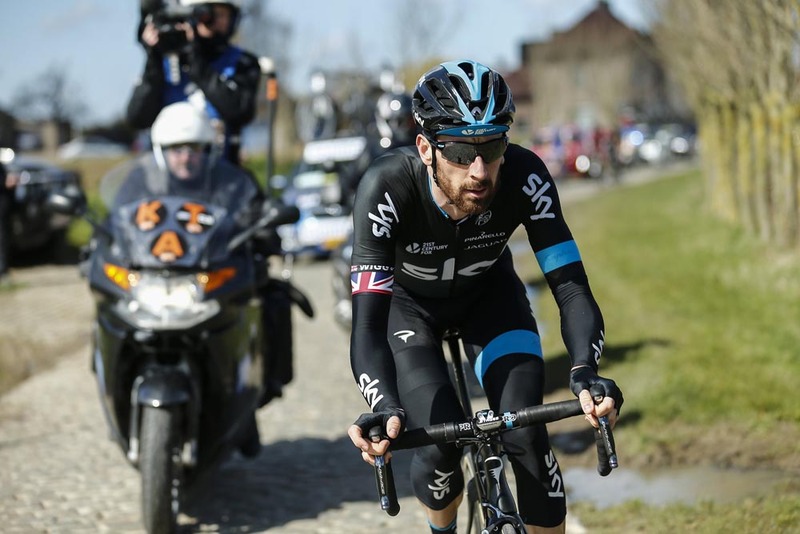 Wiggins spoke ahead of the second stage of De Panne. Though the sun shined, the wind ripped across the Flanders fields and carried with it the cold 6°C air. Since he arrived, the weather has been unforgiving. High winds forced many to abandon early in Ghent-Wevelgem on Sunday. They continued blowing yesterday in stage one in De Panne, when Wiggins and Sky led the charge to control the final escape. “Enjoying it? Not really. I wasn’t yesterday! I just thought, ‘F*** it. I’m going to stay in front or I’m out the back, one or the other, so…” Wiggins said. Wiggins appeared cold, but alert. He looked around to see some of his rivals, including Ghent-Wevelgem winner Italian Luca Paolini (Katusha). “De Panne doesn’t get supported like it used to. When I first came here in 2002, it was Johan Museeuw, Andrei Tchmil, Peter Van Petegem, Michele Bartoli… all those guys,” Wiggins continued. Wiggins returned to the De Panne stage race in 2003, 2009 and in Sky’s colours, in 2011. Racing for Garmin-Slipstream in 2009, he won the final time trial stage ahead of Lieuwe Westra and Stijn Devolder.